Augmentation cystoplasty remains the most widely accepted reconstructive technique for creating a compliant, large capacity bladder that protects the upper urinary tract and provides urinary continence in people with bladder dysfunction secondary to noncompliance or reduced functional capacity (1-4). Augmentation cystoplasty may be combined with continent catheterizable stoma formation for use as an accessible port for bladder emptying. In 1888, Tizzoni and Foggi demonstrated the feasibility of performing ileocystoplasty in a canine model. Ten years later, Mikulicz performed the first clinical ileocystoplasty (5). Since that time, the standard enterocystoplasty has classically evolved as a procedure performed through an open laparotomy incision utilizing various segments of well-vascularized segments of the gastrointestinal system that are reconfigured before anastomosis with the urinary bladder (6). 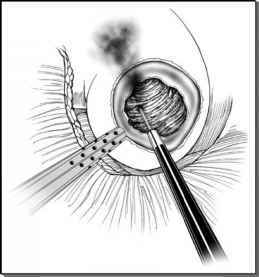 One hundred years have passed since the original open approach for this procedure has become an established reconstructive technique performed laparoscopically. No matter what surgical approach is chosen, the use of any bowel segment for augmentation is associated with advantages and disadvantages. However, the versatility of choosing a particular bowel segment, for both open and laparoscopic approaches, provides a variety of clinical options based on an individualized set of objectives for the person requiring this form of bladder reconstruction. For patients with pre-existing debilitating neurologic and other comorbid conditions, the open surgical approach may significantly prolong the hospital stay, increase the metabolic needs for wound healing, and delay postoperative recovery. Laparoscopy has distinct advantages when compared with open surgical procedures with regard to postoperative pain and morbidity, a shorter hospital stay, decreased convalescence period, and improved cosmoses. Furthermore, postoperative intra-abdominal adhesions are significantly reduced after laparoscopic surgery when compared with open surgery (7). Laparoscopy has an established role in diagnostic and ablative urologic surgery. The use of laparoscopic techniques in reconstruction has been limited because of the technical complexity of the procedures involved. The technical steps in performing a laparo-scopic bladder augmentation are designed to emulate the open surgical counterpart in every aspect, thereby producing similar functional results with improved recovery.